It is clear from last week's Scottish Labour Conference in Dundee that the wider labour movement in Scotland is aware that ownership matters. The Scottish Co-operative Party had a very productive time at the Scottish Labour Conference in Dundee recently. It is clear that the wider labour movement in Scotland is aware that ownership matters. Many speakers were taking their lead from the Scottish Co-operative Party and seeing that ownership is important. We held an excellent fringe meeting on Ownership Matters with great contributions from Johann Lamont MSP, Paul Sweeney MP and Dave Watson from UNISON. The meeting was very well attended. 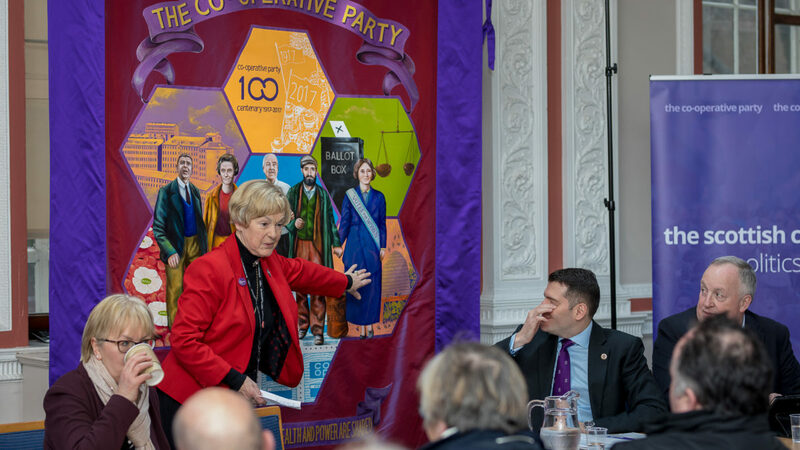 Many people were delighted to get a look at our centenary banner and particularly to celebrate Mary Barbour, whose statue was unveiled in Govan on International Women’s Day. Our new Chair, Rita Miller, addressed the conference giving fraternal greetings from the Co-operative Party. Rita spoke about the changes in the last year, paying tribute to our outgoing Chair, Cathy Peattie, and Secretary, Marjory Smith. She also pointed out the success in the council election campaign increasing the number of Scottish Labour & Co-operative councillors elected. She highlighted the unexpected General Election, and the election of two Co-operative Party MPs Ged Killen and Paul Sweeney. She also pledged to work with Scottish Labour to deliver more Scottish Labour & Co-operative MPs. Rita paid tribute to the hard work of our MSPs in the Scottish Parliament, and mentioned the work being done on Members’ Bills by Scottish Co-operative Party MSPs. She drew attention to our support for Daniel Johnson’s proposed bill to protect retail workers – making it clear that violence, threats and abuse should never be part of the job. Many people showed their support for the campaign throughout the conference at our successful stall. Our stall also encouraged people to sign our Fairtrade Fortnight petition to ensure that the world’s poor did not suffer as a result of Brexit. Most of our delegation spoke in debates at the conference and many other Co-operative Party members also spoke. Many Labour spokespeople spoke in favour of our policies in the conference and Scottish Labour leader Richard Leonard made clear his support for the co-operative model. It is clear from the conference that there is strong support for our approach which makes clear that Ownership Matters.